OPEN only (all LiftMaster operators) or SAFETY/HOLD OPEN only (operators with type B2, T TS or T1 control wiring) when vehicle passes over loop wire. Requires a loop of wire embedded in the pavement to connect to the detector. Requires 2-wire output connection to door operator and either 24VAC or 115VAC power (see individual descriptions). See pre-formed loop. G50 625 S12 - Enclosed, requires separate 12VDC power. 50 326 7 - Enclosed, requires separate 24VAC power. Wiring harness with plug for detector included. 50 326 3 - Same as above but requires 115VAC power. Pre-formed flexible vehicle sensing loop with 50 ft. of lead-in wire. 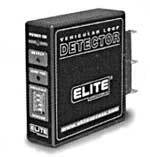 For use with all vehicle loop detectors. 4' x 8' size, convenient "saw cut" style. 6' x 12' size, convenient "saw cut" style. 4' x 8' size, pave-over style. Entrapment protection systems - Photo-electric controls. For vehicular or personnel entrapment protection. System activates when a person or vehicle passes through infrared beam. Signal beam is projected across gate's path and, when broken, sends a signal to reverse or stop the gate. Requires a two-wire connection to the operator and a 24VAC or 115VAC power source. May be used with all operators. A sensing edge should be used on every gate for the protection of pedestrians and vehicles. Depending on the type of edge and type of control wiring of the operator with which it is used, the function of the edge will vary. A standard 2-wire edge will cause a gate, to reverse when it meets an obstruction while closing. It can also be wired to stop the gate. 1. USE ONLY ELECTRIC EDGES ON GATES. 2. SPECIFY LENGTH OF EDGE WHEN ORDERING (4 ft. min.). 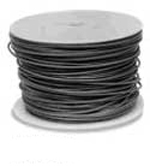 G65 MG020 4* Miller 2-wire electric edge for gates. Sensitized on three sides. Requires mounting channel. G65 ME120 C5* Mounting channel for all MG020 type edges. * Last digit indicates length of Miller in ft.